Smart Communications Inc. (Smart) announced on its Twitter account that the much-awaited Apple iPad Air will be available at selected Smart Stores starting Monday, December 16, 2013. @JohnErnest15 Hi. The iPad Air will be available starting December 16, 2013 at selected SMART Stores. We hope this helps. Thank you. Pre-order page for Smart iPad Air and iPad Mini with Retina Display already announced by Smart on December 9. List of participating stores can be found here. Smart, through its subsidiary Smart Broadband, Inc. (Smart Bro), is offering these new iPads with a range of attractive data plans that allow customers to connect to its fast LTE network with speeds of up to 42 Mbps. “We are excited to be the first to offer the latest Apple iPad Air and iPad mini with Retina display in the Philippines, two powerhouse devices that are best enjoyed with the country’s most widely available LTE network, only from the leader in mobile,” said Michele Curran, Data and International Services Marketing Head at Smart. The iPad Air and the iPad mini with Retina Display are available on Smart Bro’s iPad Plan 1499 (16GB) and iPad Plan 1699 (32GB), which both come with 65 hours of LTE Internet surfing every month and an Anti-Bill Shock Guarantee that ensures subscribers wouldn’t have to worry about excessive data charges on their monthly bills. Subscribers only need to pay a one-time fee of P1,000 for the iPad mini with Retina display or P5,000 for the iPad Air upon application to get their hands on these newest tablets of the season. The device amortization is already integrated into their monthly service fees, which means a credit card is no longer required to break the device cost into monthly installments. For complete details on pricing, please visit smart.com.ph/ipad. To subscribe to any of Smart Bro’s new iPad plans, visit smart.com.ph/bro or proceed to the Smart store near you. Meanwhile, Globe said that iPad Air and iPad Mini will be available beginning Thursday, December 19. 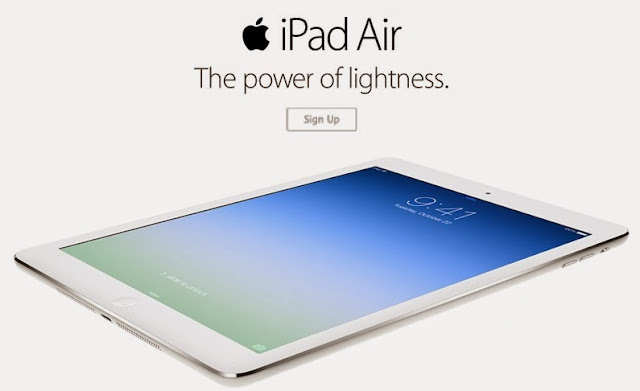 Apple launched iPad Air in the United States October 23 of this year.